Gilbert Sak is a versatile musician and an experienced conductor who has guest conducted various orchestras including the City Chamber Orchestra of Hong Kong, the Berlin Sinfonietta, the Lithuanian State Symphony Orchestra, the Kharkov Philharmonic (Ukraine). He has collaborated with such artist as Sir James Galway, pop singers Hacken Lee, Angela Zhang and Vincy Chan. He is the Music Director and conductor of the Hong Kong Civic Youth Orchestra which he founded in 2005. He has worked with choral groups such as the Hong Kong Youth Choir, the St. Paul’s Co-educational College Alumni Choir, and the choir of the Hong Kong Church of the Livingstone. Sak studied conducting with Glen Cortese and Leonard Atherton, and has participated in master classes given by such masters as Michail Jurowski, Vladimir Ponkin and Colin Metters. As an adjunct lecturer at the Hong Kong Baptist University, he has conducted various groups including the University String Ensemble, Repertory Orchestra and Women’s Choir. The Kharkov Times hailed him as being “accurate and precise” and praised that “he opened a new expressive page of Rimsky-Korsakov’s music”. Takung Pao (Hong Kong) called him a “technical conductor who can command the whole stage”. As the first Hong Kong native to have received a doctorate in violin performance, Gilbert Sak has studied in Germany, England and the U.S.A., under the tutelage of a number of world famous violinists and pedagogues including Michael Goldstein, Albert Markov, Yfrah Neaman and Petru Munteanu. 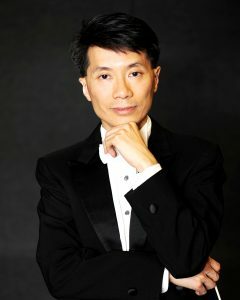 He has held principal positions in a number of orchestras in the U.S.A. and his participation in international music festivals and concert tours has brought him to countries like China, Japan, Korea, Singapore, Malaysia, Italy, Germany, and the Switzerland. After his return to Hong Kong, he served as the Principal 2nd Violin and subsequently the Co-Leader of the City Chamber Orchestra of Hong Kong. He has performed under the batons of such maestros as Kurt Masur, Lorin Maazel, Sir Neville Marriner, Yan-Pascal Tortelier and Myung-Whun Chung, just to name a few. In addition to his conducting duties and performances, Dr. Sak is a highly sought-after pedagogue in Hong Kong. He has taught violin, viola and chamber music at the Hong Kong Baptist University, the University of Hong Kong, the Chinese University of Hong Kong, the Education University of Hong Kong and the Hong Kong Academy for Performing Arts. Since 2004, he has been an orchestral advisor of the Hong Kong Scout Performing Arts Committee. In 2009, he was appointed as the Hong Kong Consultant in Strings by Trinity Guildhall of London. Besides his musical merit, Dr. Sak is a member of the Hong Kong Mensa and is an alumnus of the Open University of Hong Kong where he earned a Master of Education degree.